For the unrelated Archie comic special, see Sonic Live! Sonic Live! 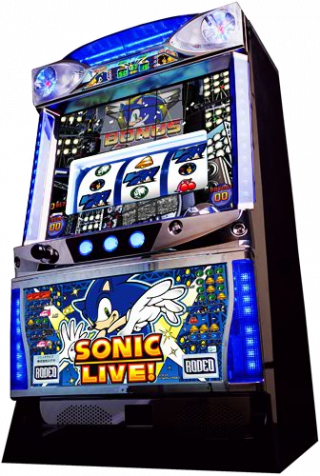 (ソニックライブ) is a slot machine (or "pachislot") game released in 2008 in Japan by Rodeo. The game is controlled using a handle on the front and a single red button. The area around the wheels is a video screen, playing a video of Sonic, Tails, Knuckles and Amy in band. As with all slot machines, cash prizes are awarded for matching symbols on three wheels. Front of machine in an arcade in Asakusa, Tokyo. This page was last edited on 1 July 2013, at 20:20.